Atlas Dewatering specializes in the lowering of groundwater tables as well as its removal from solid soil material by wet classification known as dewatering. 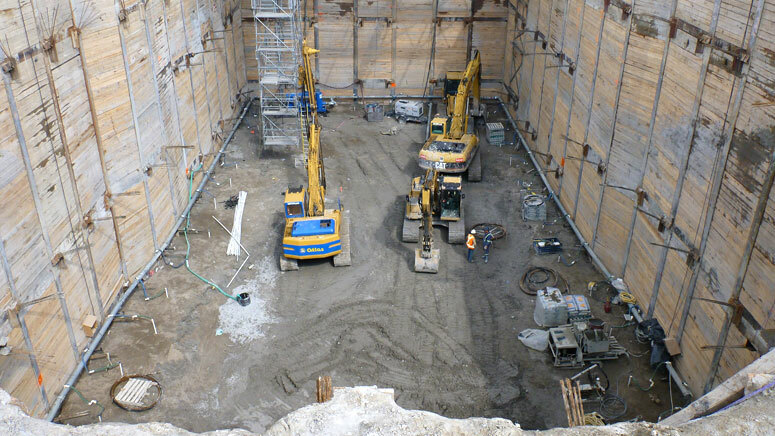 Dewatering is also known as construction dewatering, unwatering or water control which describes the removal or draining of groundwater or surface water from a construction site, caisson or mine shaft by pumping. This water taking may require a permit issued by the Ministry of the Environment. Atlas Dewatering is fully capable of executing the Permit to Take Water process and applications. Atlas offers an extensive line of wellpoint, educator, deep well and pressure relief systems to accommodate any dewatering need with a Ministry of Environment Certified “hands on” workforce. To complete your job, a full complement of support equipment such as boom trucks, zoom booms, backhoes, cranes, loaders and drill rigs are available at Atlas Dewatering. Suitable for a wide range of soil conditions varying from coarse gravel to silt to depths approaching 5 meters. Suitable for low flow soil and laminated conditions and where deep applications are necessitated.